Real deal: Want to visit an authentic Greek island that isn’t a mainstream tourist magnet like Mykonos, Rhodes, Santorini, or even its nearby neighbour, Skiathos? 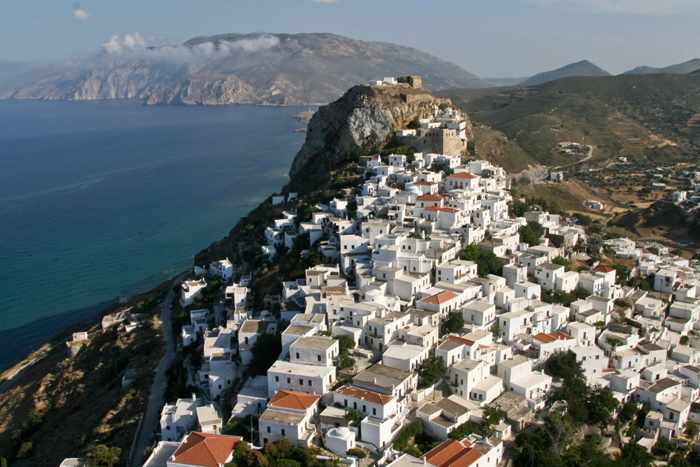 Then have a look at Skyros, the southernmost and largest island in the Sporades archipelago. Skyros has everything you would want and expect from a great Greek island holiday destination — impressive landscapes and coastal scenery, inviting beaches, picturesque villages, historic sites, good food, and age-old local traditions — without the massive crowds and commerciality of other islands that have become household names around the world. Though it is becoming increasingly popular with visitors from around the world, and has an international airport that receives direct charter flights from several European cities during July and August, Skyros is a relatively low-profile destination that isn’t even on the radar for most tourists planning vacations in the Greek islands. 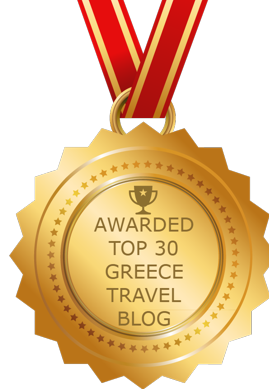 In fact, there were only 3 question-and-answer threads posted on TripAdvisor’s Skyros travel forum in all of 2015, and just 10 in total since 2010. The Skiathos forum, by comparison, had more than 6,100 conversation threads as of mid-May 2016. With so much going for the island, It’s rather surprising that Skyros doesn’t get more attention from travellers — especially considering that it gets good press whenever it’s mentioned in social and regular media. For instance, Skyros was cited as the best destination for alternative travel and holistic holidays in The Telegraph’s January 2016 feature The 19 best Greek islands, and was included in a piece the Independent published about Holidays for single travellers. Also in January, The Irish Examiner published A letter from paradise on the Greek island of Skyros, a journalist’s account of her writing holiday. And in 2015, Thomas Cook Airlines named Skyros as best destination for “healthy lifestyle holidays” in its profile of Greece’s top 10 islands. Please continue reading on page 2, where you’ll find more pictures and videos along with links to more than a dozen different websites with Skyros travel information and photos. Crete on foot: Hiking enthusiasts may soon see what Crete’s trekking paths look like without having to take a single step on any of the trails. The Region of Crete and Google are participating in a project to photograph some of Crete’s major hiking routes for Google Trekker, a version of the company’s popular Street View app that lets people take virtual tours of places from their computers and mobile devices. The Trekker program has an ambitious goal of mapping the world — including out-of-the-way and hard-to-reach places where camera-equipped vehicles can’t travel. Footpaths are filmed by hikers who walk the routes wearing a backpack equipped with Google Trekker photography equipment. The video above was published on the Region of Crete YouTube page in January, and shows a hiker mapping trails in several areas across the island, including Agia Roumeli, Psiloritis, the Asterousia Mountains, the Lassithi Plateau, and Agios Nikolaos. There were no notes accompanying the video to indicate when the various trails will be available for viewing on Google Maps, but the 16-minute film will be interesting to hikers planning trips to Crete since it shows what the terrain and scenery are like on some of the routes, and gives a good impression of the degree of difficulty on the different trails. Sifnos, another Greek island that’s popular for trekkers and walkers, already has four of its scenic hiking routes available for viewing on Google Maps, as I reported in my recent post Sifnos: A Walker’s Paradise. If you’d like to take a virtual trek along some of the Sifnos paths to see what the experience is like, and get an idea of what the Crete Trekker views will be like when they’re available, click here. Trekker treat: A video released just today has me aching to visit Sifnos to walk all over the island. 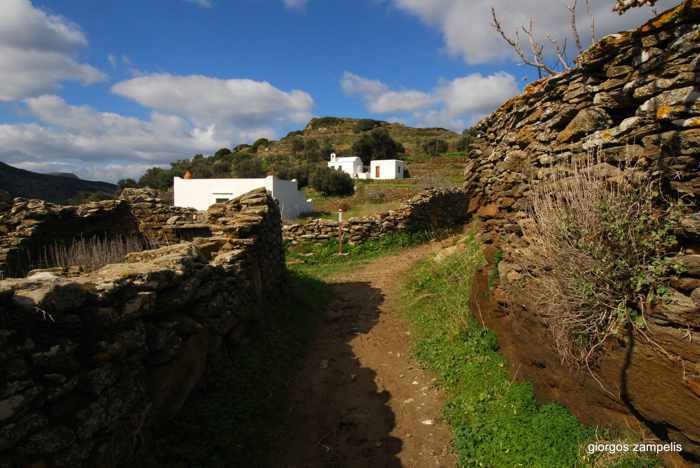 Sifnos Trails, hike on an authentic Greek Island! is a nearly 6-minute-long promotional film that spotlights the island’s vast network of professionally signposted hiking trails. With fabulous aerial and trail-level videography by Photo Kontos, the video is bound to inspire legions of trekking enthusiasts to visit Sifnos to explore some or all of the 19 different trails that extend more than 100 kilometers in total. As you would expect, the film features beautiful mountain, valley, village and coastal scenery. What’s also impressive is the expertly-developed way-marking system, shown in the video, that helps guide trekkers along the trails. Viewers also are informed of a free app for Android smartphones, and are directed to a Sifnos Trails website that provides extensive information about the island and its paths, downloadable route maps, and galleries of gorgeous island images by four photographers. The Sifnos Trails website includes photo galleries featuring beautiful images by Giorgos Zampelis and three other photographers. There are hundreds of photos on the Sifnos Trails Facebook page, too. When we visited Sifnos in 2007, we knew that the island had an extensive network of footpaths, but they weren’t easy to find or follow. I bought a booklet that described more than two dozen hiking itineraries, but the directions for the first three walks that we attempted led us to dead ends (quite literally — we wound up in a cemetery on one hike!) We eventually gave up on the brochure and simply wandered around. It was good fun nonetheless, but signposts and directional markings would have helped us see far more of the island. 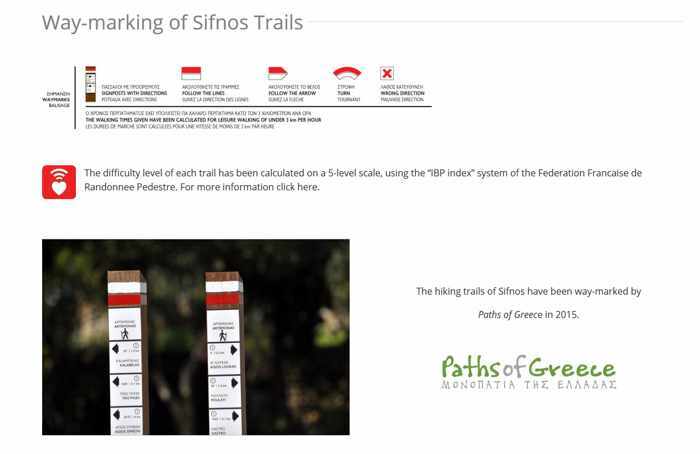 When I discovered the Sifnos Trails video today, I immediately wondered when the way-marking system had been implemented, since I had heard nothing about it. Turns out that the island municipality undertook the Sifnos Trails project in 2015, collaborating with Paths of Greece to improve the trail network to “help the island’s visitors explore its natural and cultural beauties in a pleasant way.” The project is funded and managed by the municipality of Sifnos. Besides the website the Android app, there is a Sifnos Trails Facebook page with further information and hundreds of photos of hiking paths and stunning Sifnos scenery. If you’re planning to visit Sifnos this summer, be sure to bookmark the website and Facebook pages so you can read up on the walking routes before going. Happy trekking once you’re there! 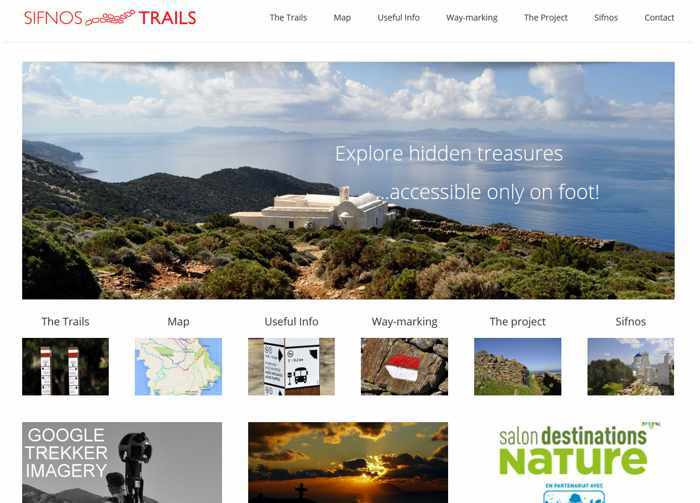 A screenshot of the home page for the Sifnos Trails website, which describes the island’s trail project and provides extensive information about the routes and the island in general. The website provides detailed descriptions and maps for each of the 19 walking routes, along with helpful tips and advice. 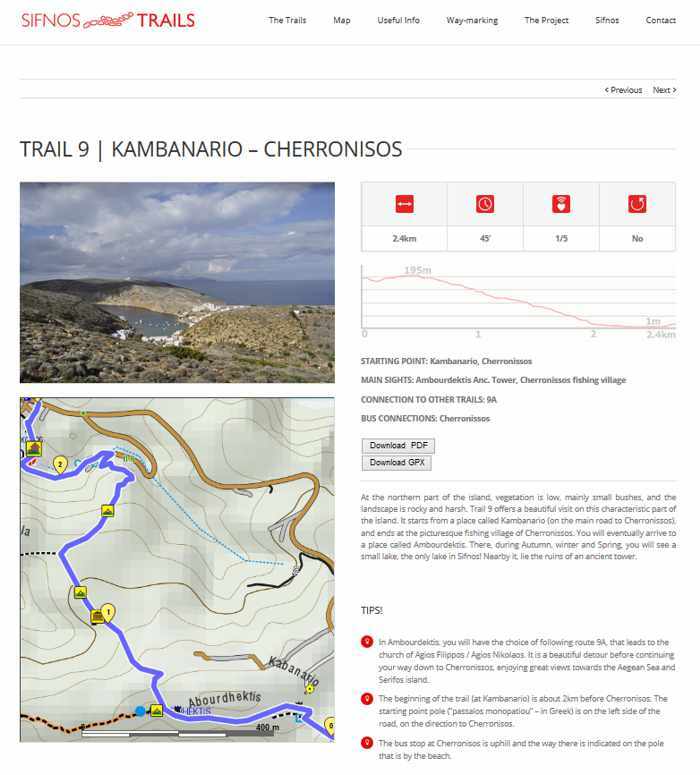 This is a screenshot of the information page for Trail 9 (Kambanario — Cherronisos).